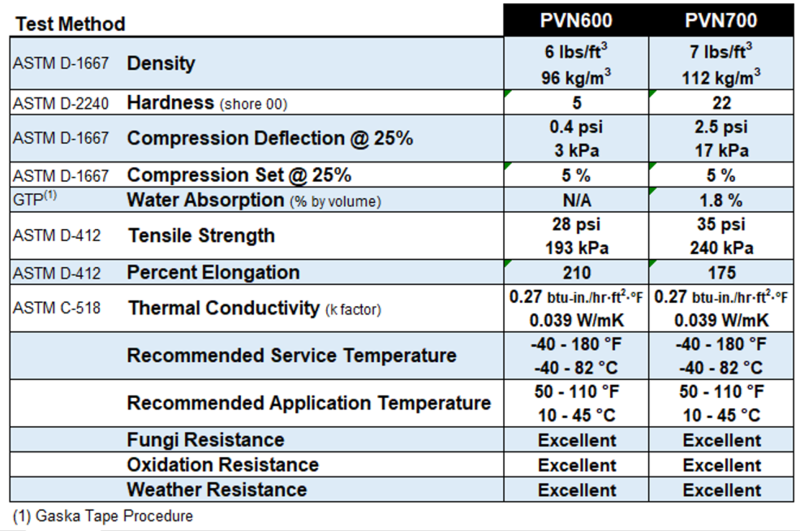 PVN Series – Gaska Tape Inc.
Gaska Tape’s PVN Series product is a light density Polyvinyl Nitrile (PVC/NBR blends) semi-open cell foam as well as a full range of closed-cell foams. This series can be cast on release paper liners or permanently bonded to polyester film or aluminum foil. PVN is made in a wide range of densities with a smooth, sharp, glossy finish on one side and available with an aggressive pressure sensitive adhesive on the opposite side. Characteristics common to all Polyvinyl Nitrile products (PVC/NBR blends) include the ability to have good resistance to chemicals, abrasion and tearing. This product is suggested for use in applications requiring improved heat, oil and fuel resistance, as well as improved elasticity. These materials are generally used for cushioning, insulating and vibration dampening. PVN Series is a self-extinguishing formulation and meets FMVSS 302A. PVN is cast on a 7 mil clay coated paper. PVN6# complies with Ford Specification WSB-M3G102-B2 and is semi-open cell. PVN7# complies with Chrysler Specification MS-AY516 Type 1. Good for chemical resistance & durability. PVN Series is available in higher density (up to 30 pcf), even more durable upon request.